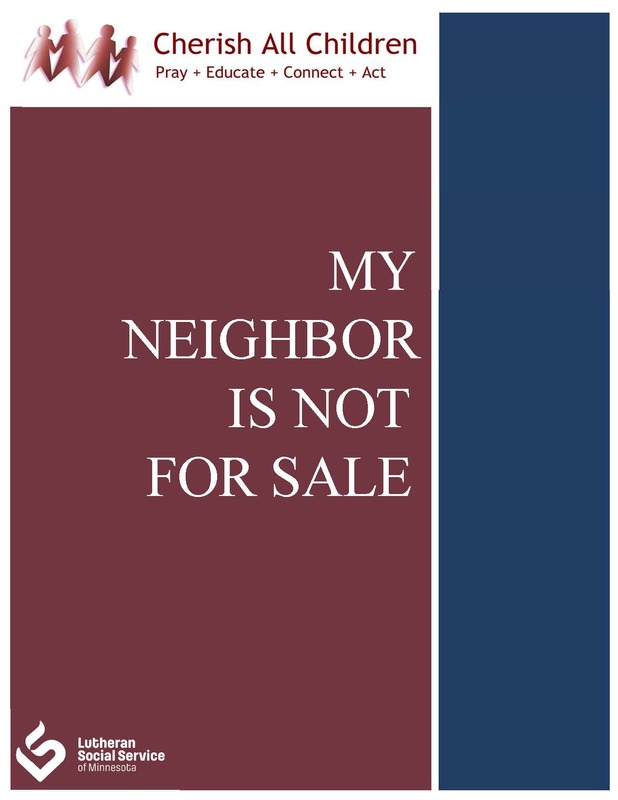 Designed to help your congregation understand the issue of child sexual exploitation and trafficking, My Neighbor is Not for Sale is a four-part guide designed for Adult Education sessions, Lenten studies, Youth groups, etc. Created in collaboration with Lutheran Social Service of Minnesota, this guide can be used in congregations nationwide to learn about sexual exploitation and trafficking, about ending the demand, and about prevention. Education and awareness are key prevention measures in keeping children safe from harm. Each session introduces you to a key topic to prevent child sexual exploitation, offers a Biblical response, and questions to discuss in your group. To download and make copies of the complete study, follow this link. Printed copies are availabe for $4 (booklet) and $6 (plastic comb binder) Contact Joy McElroy to order copies. It is our sincere hope that congregations will use this resource to learn what action you can take to make a difference to protect all children and youth.